The PS3-exclusive Metal Gear Solid collection now includes a familiar game from 1987. Note: The original story states that Metal Gear and Metal Gear 2: Solid Snake were new additions to the collection, but these were already included in Metal Gear Solid 3 HD Edition. The art book is the only new material being added to the collection. We apologize for the confusion. The Metal Gear series is one that can be overwhelmingly complex for newcomers, and it's not hard to understand why. The story has been ongoing since the 1980s without a single reboot, and frequently references the convoluted history of its previous entries. That makes news of the Metal Gear Solid Legacy Collection all the more appealing for anyone hoping to brave Solid Snake's journey from start to finish. Even better are details appearing on Konami's websites detailing bonus content not mentioned in the original announcements. Specifically, both Western and Japanese versions of the set now include Hideo Kojima's original Metal Gear games, while the game's Japanese website mentions an 100 page art book by Yoji Shinkawa. For those keeping count, this means that the Metal Gear Solid Legacy Collection includes Metal Gear, Metal Gear 2: Solid Snake, all four core Metal Gear Solid games, the MGS: VR Missions, MGS: Peace Walker, and two full graphic novels. 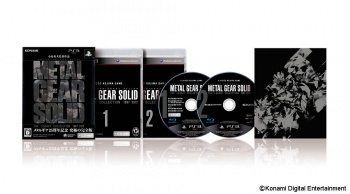 The attached image of the Japanese edition shows that multiple Blu-Ray discs are required to store it all, and even then two entries (including Metal Gear Solid) will use off-disc download codes. It's not entirely clear whether North American audiences will get an art book of their own, but so far the option doesn't appear to be ruled out. The Legacy Collection still doesn't include every single Metal Gear game (we'd need Twin Snakes to truly impress the fans) but it's still an impressive compilation for newcomers and series veterans alike. The Japanese release date has been set for July 11th, so hopefully we'll all be able to sneak around in digital boxes within a few months.